Uranus and Neptune have a lot in common, climate-wise, even though Uranus is tipped on its side with the pole facing the sun during winter. They are both home to extreme winds blowing at speeds of over 1000 km/hour, they have hurricane-like storms as big as our whole planet and immense weather systems can last for years. But what about their origins? Do the atmospheric patterns arise from deep down in the planet, or are they confined to shallower processes nearer the surface? Understanding the atmospheric circulation is not simple for a planet without a solid surface, where Earth-style boundaries between solid, liquid and gas layers do not exist. Since the discovery of these strong atmospheric winds in the 1980s by the Voyager II spacecraft, the vertical extent of these winds has been a major puzzle – one that influences our understanding of the physics governing the atmospheric dynamics and internal structure of these planets. The wind patterns seen on the surface can extend only so far down on these two worlds, according to a new paper. A team led by Dr. Yohai Kaspi of the Weizmann Institute's Environmental Sciences and Energy Research Department used a novel method for analyzing the gravitational field of the planets to determine an upper limit for the thickness of the atmospheric layer. Deviations in the distribution of mass in planets cause measurable fluctuations in the gravitational field. On Earth, for example, an airplane flying near a large mountain feels the slight extra gravitational pull of that mountain. Like Earth, the giant planets of the solar system are rapidly rotating bodies. In fact all of them rotate faster than Earth; the rotation periods of Uranus and Neptune are about 17 and 16 hours, respectively. Because of this rapid rotation, the winds swirl around regions of high and low pressure. (In a non-rotating body, flow would be from high to low pressure.) This enables researchers to deduce the relations between the distribution of pressure and density, and the planets' wind field. These physical principles enabled the co-authors to calculate, for the first time, the gravity signature of the wind patterns and thus create a wind-induced gravity map of these planets. By computing the gravitational fields of a large range of ideal planet models – ones with no wind – a task conducted by team member Dr. Ravit Helled of Tel Aviv University – and comparing them with the observed gravitational fields, upper limits to the meteorological contribution to the gravitational fields were obtained. This enabled the team to show that the streams of gas observed in the atmosphere are limited to a "weather-layer" of no more than about 1,000 km in depth, which makes up only a fraction of a percent of the mass of these planets. Although no spacecraft missions to Uranus and Neptune are planned for the near future, Kaspi anticipates that the team's findings will be useful in the analysis of another set of atmospheric circulation patterns that will be closely observed soon: those of Jupiter. Juno was launched in 2011; upon reaching Jupiter in 2016 it will provide very accurate measurements of the gravity field of this giant gaseous planet. 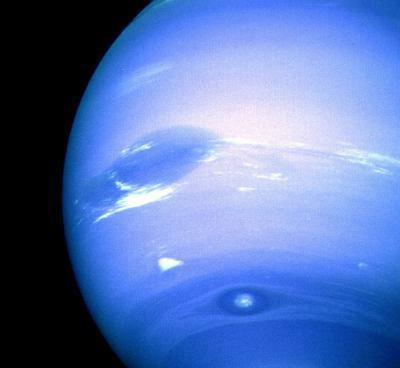 Using the same methods as the present study, Kaspi anticipates that they will be able to obtain the same type of information they acquired for Uranus and Neptune: namely, placing constraints on the depth of the atmospheric dynamics of this planet.